I had the great honor and pleasure to take part in a fast-paced Ignite Session at NCTE in Boston. Ignites are quick presentations, where the 20 slides move on a synced delay and you need be concise and in focus. Five minutes and you are done. My own Ignite presentation was about using video game design in the writing classroom. 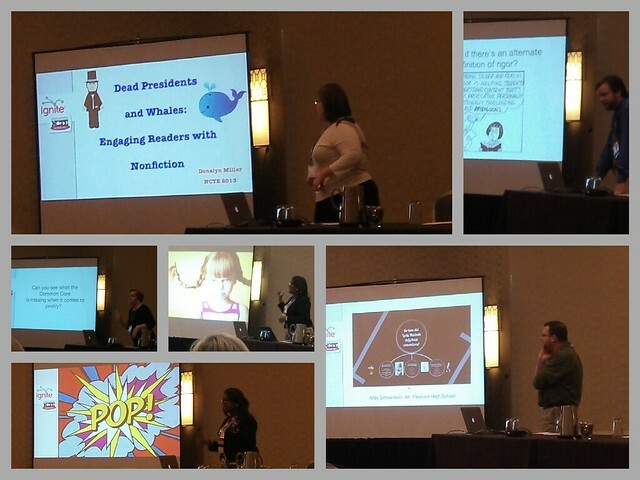 But to share the stage with Penny Kittle, Sara Kajder, Donalyn Miller, David Finkle, Sandy Hayes and others was a blast. Many defined school as prison, box, etc. I’ve linked as many Twitter accounts as I could find to presenters, and suggest you might want to follow them. This entry was posted in NCTE. Bookmark the permalink. I attended the ignite session. Thank you for creating and sharing the notes! Sorry I was not able to meet you in person at NCTE13! I agree that all of these speakers were very inspiring in what they shared. Also glad the ignite session had turn and talks! I know … too many people … maybe next year? Your notes whet a learner’s appetite, making me wish I caught at least some of these presenters. The logistics of getting in to “high demand” classes was my chief frustration as a first-timer at NCTE. Clearly I have a thing or two to learn, but the “solution” of skipping a class to secure a seat at an upcoming, sure-to-be-overfilled room doesn’t seem perfect, either. Ah, well. A year to mull…. I missed this powerful session but heard RAVE reviews! Thanks so much of rate notes! Hi Kevin! Thanks for the great recap. It was my great pleasure to share the stage with you and the other fantastic presenters.